With halting and reversing deforestation seen as key to achieving the Sustainable Development Goals (SDGs) and the objectives of the Paris agreement on climate change, the Collaborative Partnership on Forests organized from Feb. 20-22 the conference “Working across sectors to halt deforestation and increase forest area” in Rome, to discuss ways of meeting these targets in the coming years with various actors and stakeholders. The conference included a session on science and research coorganized by the International Union of Forest Research Organizations (IUFRO) and the CGIAR Research Program on Forests, Trees and Agroforestry (FTA), in which participants discussed how science-based innovations have the potential to revolutionize the way forests and landscapes are monitored and managed, provided such innovations are mainstreamed and made more accessible to users, including enabling their use in local languages. The session’s panelists were Ambassador Hans Hoogeveen, Permanent Representative of the Netherlands to the Food and Agriculture Organization of the UN; Daniela Kleinschmit, Professor of Forest and Environmental Policy at the University of Freiburg and Coordinator of IUFRO’s Division 9 on Forest Policy and Economics; Avery Cohn, Assistant Professor of International Environment and Resource Policy for the Fletcher School at Tufts University; Pablo Pacheco, Principal Scientist at the Center for International Forestry Research (CIFOR); and Christopher Stewart, Head of Corporate Social Responsibility for OLAM. Representing the organizers, IUFRO Vice President John Parrotta moderated the session and FTA Director Vincent Gitz contributed as a panelist. Ambassador Hoogeveen introduced the session with a wake-up call for forests, the planet, and the people living on it. Science could play a crucial role in forming a clear message for the United Nations High-level Political Forum on Sustainable Development (HLPF), and youth could also play a role in this, he suggested. 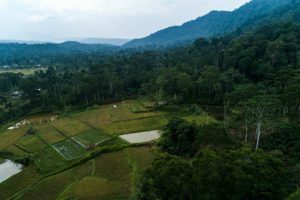 Governments know that forests are important, the ambassador said, but they are often more focused on other pressing issues. Forests, therefore, must be placed among these most pressing of issues. 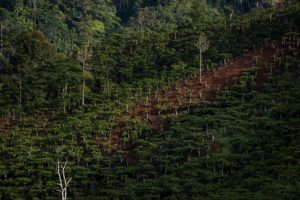 One approach may be for science to make the business case for forests, which would encourage private sector involvement. From the perspective of FTA, Dr. Gitz emphasized that science is promoting cross-sectoral coordination in three ways. First, science uncovers and shows links, relations and solidarities between sectors, in a way that cannot be ignored. Second, science cannot be disconnected from implementation. Science and research can provide evidence for stakeholders to understand the forces at play, and the suitability of options and solutions according to different contexts. Third, by the very process of constructing evidence, and in a solution oriented way, science and research create favourable conditions for coordination between sectors. Fellow panelist Prof. Kleinschmit noted that deforestation was a challenge for science, as the causes and effects are complex, and analysis and finding solutions can be difficult. She highlighted the need to orchestrate and integrate scientific expertise with other forms of expertise in order to create solutions and policies that are sensitive to context. Prof. Cohn explained how evidence-based supply-chain initiatives could have a role in reducing deforestation, and tropical forest goods and services could contribute to development. Like Ambassador Hoogeveen, he also discussed the business case for forest conservation. Dr. Pacheco highlighted the importance of the coproduction of knowledge, saying that research must be credible, legitimate and relevant — for science to be usable, we must adjust to the needs of stakeholders. We can build on new forms of governance, he suggested, and upon multistakeholder platforms on sustainability. Finally, Dr. Stewart discussed how those in the private sector define sustainability: a long-term supply of what they need. He pointed to the need for ways to better determine the value of different types of capital such as natural capital and intellectual capital, and suggested that forest and land management practices be reoriented so that we use only the interest on the natural capital, rather than the capital itself which is very often the case today. The panel concluded that there is a need to look at the interface between forests and other sectors, including how to link small projects with broad international commitments. If a disconnect exists between science and political dialogue, science needs to critically look at internationally agreed upon targets, and if actions are going in the right direction as well as creating strong alignment among targets. In fact, there has been considerable movement, especially in CGIAR, toward the improved alignment of science with targets determined at global and national levels. The SDGs are instrumental in that sense. IUFRO underscores the importance of platforms bringing together science with policymakers, the private sector and other stakeholders. Such platforms are key for increasing mutual understanding, aligning research priorities with the needs of stakeholders, enhancing uptake and implementation. There are many examples of substantive, transformative knowledge available in research that can be transferred and scaled up for greater impact. FTA gives priority support to research that engages with stakeholders from the ground up, including civil society and the private sector. This engagement is multifold — on work priorities, problem statements, research questions, elaboration of research protocols and the best use and uptake of results. Creating mechanisms that engage research with stakeholders is also needed because much of the evidence and data are in the hands of stakeholders: communities and the private sector. At both IUFRO and FTA, we believe that the very process of constructing evidence in a solution-oriented way can be a pathway for increased coordination between sectors. Science itself needs to be cross-sectoral in its approaches, as this can facilitate various sectors getting on board. We expect that the implementation of the SDGs will encourage such approaches. By IUFRO Vice-President John Parrotta and FTA Director Vincent Gitz. This is interesting and insightful. The role of science in achieving the SDGs cannot be over-emphasized. Given that it has a cross-sectoral twinge, it is all the more important to strengthen the link between science and policy such that mainstreaming science across sectors can be effective.